Author(s): Milda  Sulciene, Antanas Karalius, Inga Matijosyte. Vilnius University, Institute of Biotechnology, Sector of Applied Biocatalysis, V.A. Graiciuno str. 8, Vilnius, LT-02241, Lithuania. Investigation of polyol synthesis from rapeseed oil as a raw material, which is easily available in EU, is essential for the development of industrial biotechnology in order to meet green chemistry requirements and sustainability goals of polyurethane (PU) consumers. The objective of this research was to develop a green synthetic route for polyol production from rapeseed oil as it is yet a new research area without any definite methodology to follow. During this study, the two stage biopolyol synthesis was investigated: epoxidation and hydrolysis. The reaction parameters were determined for epoxidation process using commercially available enzyme - lipase Novozym 435 and in situ generated peracid from linoleic acid. Due to instability of the immobilization carrier of lipase Novozym 435, the hydrolysis reaction was explored by applying ion exchange resin, Amberlyst-15, with strongly acidic sulfonic group as a reusable catalyst. The obtained results conclusively demonstrated a sustainable chemo-enzymatic process for the synthesis of polyol from rapeseed oil. Keywords: Amberlyst-15, lipase, epoxidized oil, polyol, rapeseed oil. Affiliation:Vilnius University, Institute of Biotechnology, Sector of Applied Biocatalysis, V.A. Graiciuno str. 8, Vilnius, LT-02241, Lithuania. Keywords:Amberlyst-15, lipase, epoxidized oil, polyol, rapeseed oil. Abstract:Investigation of polyol synthesis from rapeseed oil as a raw material, which is easily available in EU, is essential for the development of industrial biotechnology in order to meet green chemistry requirements and sustainability goals of polyurethane (PU) consumers. 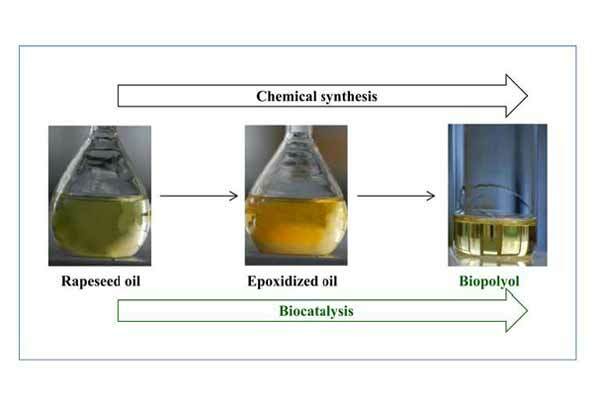 The objective of this research was to develop a green synthetic route for polyol production from rapeseed oil as it is yet a new research area without any definite methodology to follow. During this study, the two stage biopolyol synthesis was investigated: epoxidation and hydrolysis. The reaction parameters were determined for epoxidation process using commercially available enzyme - lipase Novozym 435 and in situ generated peracid from linoleic acid. Due to instability of the immobilization carrier of lipase Novozym 435, the hydrolysis reaction was explored by applying ion exchange resin, Amberlyst-15, with strongly acidic sulfonic group as a reusable catalyst. The obtained results conclusively demonstrated a sustainable chemo-enzymatic process for the synthesis of polyol from rapeseed oil.